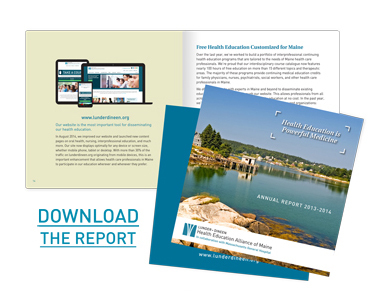 This Annual Report is an opportunity for you to learn more about how we’re fulfilling our mission to improve the health of Maine residents. The report highlights the goals we have accomplished, major initiatives we have in progress, and many of the insights we have gleaned as we strive to fulfill the vision set forth by the Lunder Foundation and the Lunder family, whose generous gift established the Lunder-Dineen Health Education Alliance of Maine, in collaboration with Massachusetts General Hospital. Throughout the coming year, we will continue to keep all of our colleagues in Maine’s health care community informed about the progress we’re making. Thank you for your continued collaboration with us. “Bath salts” is the street name for a number of illicit drugs that contain cathinones. They look similar to epsom salts and have effects similar to cocaine and amphetamines. Use in Maine continues to be a problem; Lunder-Dineen regularly receives requests for bath salts education. Because of the significant medical morbidity and collateral damage inflicted by impaired bath salt users, health care providers, emergency first responders, law enforcement, and clergy require the most up-to-date evidence-based review of bath salts use, its emergency management, and prevention strategies. This session is intended for health care providers in clinical settings. Motivational interviewing (MI) has been found to be an important and effective way for health care providers such as physicians, nurses, social workers and counselors to speak with their patients about behavioral change. It has been shown to be effective with patients who aim to engage in smoking cessation, weight loss, and exercise, and comply with prescribed medication regimens. This program will address four different problems which negatively affect health: non-adherence to treatment guidelines, poor eating habits, lack of exercise and smoking. The activity will also provide scenarios that demonstrate how MI is used in the clinical setting. This session is intended for physicians, nurse practitioners, and social workers.